Mazda has given its clearest hint yet that it is planning to launch an Aston Martin-rivalling grand tourer sports car with the Vision Coupé, revealed at the Tokyo motor show. The striking four-door coupé features what Mazda has called the next generation of its Kodo design language, with “less is more” styling. Mazda says it draws from the R360 from 1960 and Mazda Luce from 1969. No performance details about the new concept have been revealed. Mazda is understood to have been considering a new sports car since the unveiling of its RX Vision concept at Tokyo in 2015. 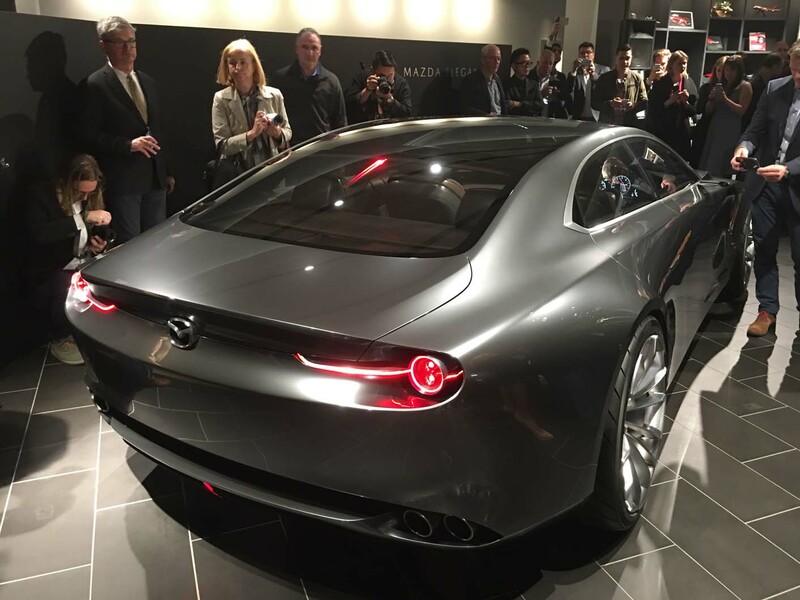 It was initially understood to be looking at a new rotary-engined machine, but it could also use a version of the firm’s Skyactiv-X compression ignition technology, which is due in 2019. Mazda officials have previously told Autocar that engine is designed to work with electrified elements, suggesting a hybrid set-up could be used to boost performance. Mazda recently unveiled its Zoom Zoom 2030 road map for the future. This includes the launch of Skyactiv-X, its new design language and a new customisable vehicle architecture platform. That road map helps pave the way to the firm’s centenary in 2020, which would be a natural date for Mazda to launch a new range-topping sports car. The Vision Coupé concept features an uncluttered interior design that, Mazda says, reflects the Japanese concept of ‘ma’, using space to create atmosphere. It features an interactive centre console that brings up information on the display when touched. Lol, Callum could never desing something as good looking as this, he simply doesnt have the talent. One of the most beautiful cars of all time. But, Mazda are nowhere near upmarket enough to be able to compete with Aston Martin. Omg. just build the vision coupe mazda!!! this thing is dropdead gorgeous. Mazda have the best designers in the business. No question. Seriously replace the Mazda 6 with this and I'll buy one.... and I don't even like Japanese cars! The interior looks brill .....the lights, the front, ther rear and the proportions.....too good a shape for a Japanese car. Just built it as is....no more body panel joints or any fancy plastic. I inherited a Mazda 6 company car. I hate it. I suspect that Mazda's current philosophy of prioritising weight saving over quality is partly to blame. It has dials that resemble the read out from a 1970's pocket calculator, unintuitive controls and a poor sat nav. The interior is cheap, flimsy and scratchy and under strength boot hinges mean I hit my head every other time I use it. The stop start function is like Russian roulette in traffic and while it is reasonably fast and economical it doesn't handle like I'd expect of a car that has a similar bloodline to a Mondeo. My previous model XF is miles better in every way. So I would find it difficult to believe they could turn their hand to something that could rival an Aston Martin. To be credible they'd have to create a sub brand like Lexus, maybe use the Xedos or whatever their attempt at an Exec was called in the 90's. However, even I disillusioned as I am, can see this is a nice piece of design.